It was the bike that caught my attention. The adult tricycle was painted shocking pink and was festooned with dozens of blinking hearts on keyrings on the back basket. A pink plate read “Dancin’ Annie’s Pink Cadillac.” It was parked most afternoons by the door of the Oyster City Brewing Company. The Oyster CIty Brewing Company became our hangout on post-beach days. Oyster City has craft beer and a popcorn maker. If you want a soda or water or wine, you can go across the street, get a soda or a Chardonnay in a plastic cup and rejoin your party in the brewery. Food? There’s tons of places for that, just not at Oyster City. Dogs are also welcome in the brewery, and Red Dog loves collecting popcorn and pets from the customers. 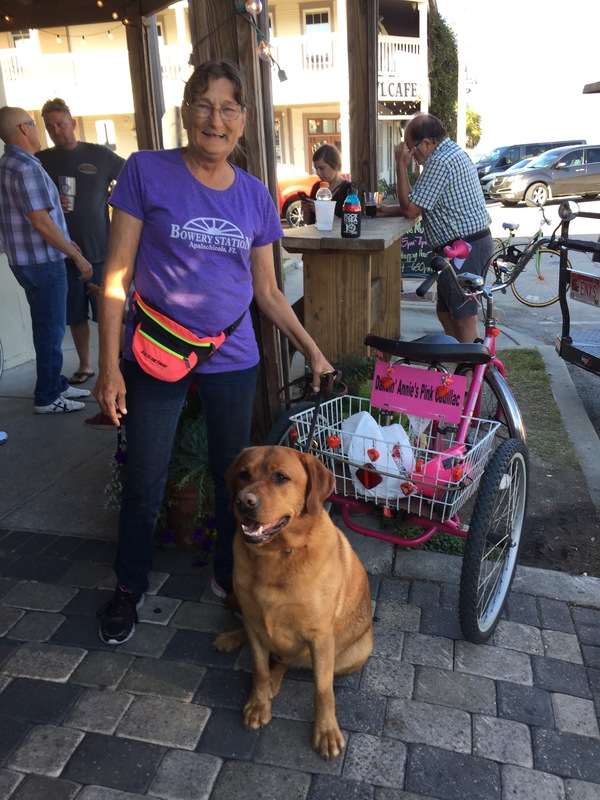 Frequent any place in Apalachicola and you’re bound to notice the regulars, and the brewery attracts an entertaining bunch. If we didn’t know someone’s a given name, we invented one for them. Biker Guy, an Ohio transplant who looked like Sam Elliot’s younger and less successful brother. He was always dressed in his leathers and arrived at the brewery promptly at 4:00. We’d see him cruising on his Harley here and there around town. He told me he was a carpenter and did pick up work in the area. We first met Bird Guy at the chili cook off on St George Island. He always had a macaw on his shoulder. His thing was to sidle up to some PYT and get the bird to hop on her shoulder. He often did this without asking, and we witnessed both a girl and the poor bird both scream bloody murder when the bird grabbed the strap of her top and put one foot on her bare shoulder, and she flung the bird away in a panic. We learned that he was not well-regarded by the locals. Snarky Pirate Wench is one of the bartenders. She was full of attitude and unpredictable behavior. You never knew what kind of a reception you would get from her. I suppose that years of pulling beer for people like Bird Guy had made her grumpy. Our last night at the brewery, we found her to be positively pleasant. Perhaps she was glad to be rid of another set of senior citizens, one of whom doesn’t care for beer and was always across the street (me). Then there was Kyle From Dayton, a bar employee who is heavily inked. We met when I asked hm if Red Dog could have some water from the hose he was using to clean off the sidewalk. “It’s super hot water, but I can get you some cold inside” he said. We chatted a bit. He’d come to Apalachicola to visit a girl and never went home. Now he’s working the brewery and playing in a two piece combo band. He was vague about his style of music. I asked him if he was familiar with Ohio musicians; Chrissy Hynde. Joe Walsh. Mark Mothersbaugh. David Allan Coe. Marilyn Manson. Guess which was the only musician he’d heard of. I was feeling acutely aware of my age, but my attention was diverted to an entirely different subject. Red Dog was busy scavenging popcorn on the floor when she walked up. “He’s so beautiful! Can I pet him?” How could I refuse Dancin’ Annie? In a few minutes we were chatting away. It was open night mike at the bar, and as Annie talked to me she shuffled her feet. “I am 65 years old and I love to dance, she crowed. “I like to dance more than I like to eat! That’s why I’m so skinny!” She told me she spent her life shucking oysters. “Started as soon as I was old enough to hold a knife.” She held her hands out to show me her many scars. “This one was bad.” She pointed to a scar on her palm between her thumb and forefinger that had a corresponding scar on the back. “Went totally through. That happened before I got more experienced.” She spent her whole life in Apalachicola with a brief stint in San Diego. “What’d ya think I did out there? Shuck oysters in a fancy oyster bar!” She loved talking to the people, but eventually came back to the tiny bay town. “Thought I’d made a change for good but I just came right back.” The music kicked in and she began her little shuffle again. “All I drink is Pepsi,” as she waved an ancient looking soda bottle wrapped in a foam coozie. I was told Annie’s “cadillac” could be found parked outside of most of the bars at any time, but I didn’t have time to ask her if the draw to the bars was the beer, people or the tunes. “I gotta go and dance!” Off she went, twirling in and out through the doors of the brewery. A few minutes later she hopped on her bike and zoomed off to her next stop. Roll on Annie, roll on. Loved the pic of Annie ………..another TERRIFIC entry, Pam ! ♥♡♥ HUGS to you, Ben, & Red Dog.